Each year as Christmas approaches I wonder why we do this to ourselves: why ramp up the stress levels by trying to meet the massive expectations of the season? As if work deadlines, Christmas shopping and holiday plans weren’t enough to create a perfect storm of activity, I find myself throwing out casual invitations like confetti, energised by the idea of all those end-of-year catchups and then panicking at the thought of spending more time in the kitchen. This year, I’ve been saved by a clever collection of recipes published by Wellington food writer and former restaurateur Margôt de Cotesworth, a woman who clearly loves entertaining. 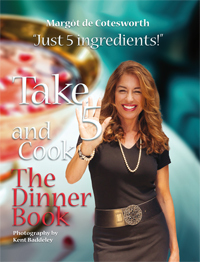 Her book Take 5 and Cook: The Dinner Book is guided by the principle that stylish dishes can be created with the minimum of effort and just five ingredients. This isn’t a new idea but Margôt manages to reduce each recipe to the basics without losing the integrity of the dish. She is also a master of taste, using simple combinations to provide maximum flavour without the addition of a myriad herbs and spices. Lamb kebabs are qiuite simply marinated in ouzo, lemon zest, olive oil and oregano, then chargrilled and served with a sprinklng of salt. Pedantic readers will have counted six ingredients but salt, pepper and a splash of olive oil are the only allowable extras in this entire collection of 120 seasonal recipes. Some are Margôt’s own family favourites. Her brother’s crisp apple tart and her mother’s fish chowder can be whipped up in a jiffy for a family meal. Others are classics and some are café staples. There are recipes for European favourites – ricotta gnocchi, tartiflette and gazpacho – and while they are certainly pared down to the bare essentials, dishes such as Not a Paella and Nearly a Tiramisu are close enough for my purposes. I’ve tested several dishes and while I always find it hard to follow a recipe I’ve mostly resisted the urge to throw in extra ingredients. I can recommend the Anchovy and Almond Sauce as an excellent accompaniment to fish or venison and I’ve enjoyed serving Pineapple with White Balsamic Dressing, but the dish that’s saved my sanity on three occasions already is Margôt’s quick-to-whip-up-but-deliciously-decadent Chocolate Silk Tart. Like all the recipes in her book the five ingredients must be top quality. I use a dark chocolate with a high percentage of cacao and I’ve found it best to use caster sugar because it melts faster. 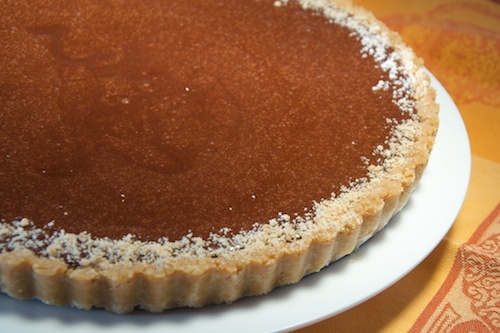 Quantities fit a loose-base 22 cm tart tin. Stir the biscuit crumbs into 60g of melted butter. Press into a well-buttered dish and chill. Melt the chocolate, sugar and remaining 125g butter, stirring over low heat until the sugar has dissolved. Cool. Beat the eggs and gradually pour in the chocolate mixture. continue beating until well combined. Pour into the crust and chill. Serve with whipped cream, if you like.